My Cluttered Corner: Waffle Flower March Release Blog Hop + Giveaway! It is the fifth of the month so you know what that means! 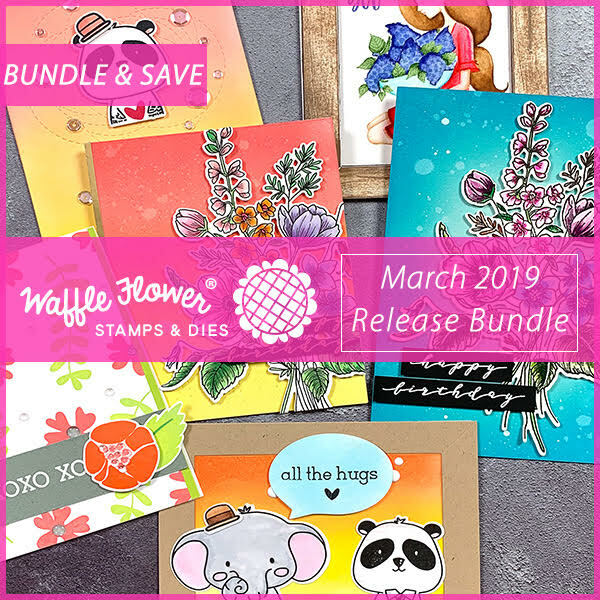 Waffle Flower Crafts release day! I am so excited about this month's release! There are so many amazing stamps and dies. Of course you can grab the entire bundle and save some money! Alright, let me show you what I've been working on! 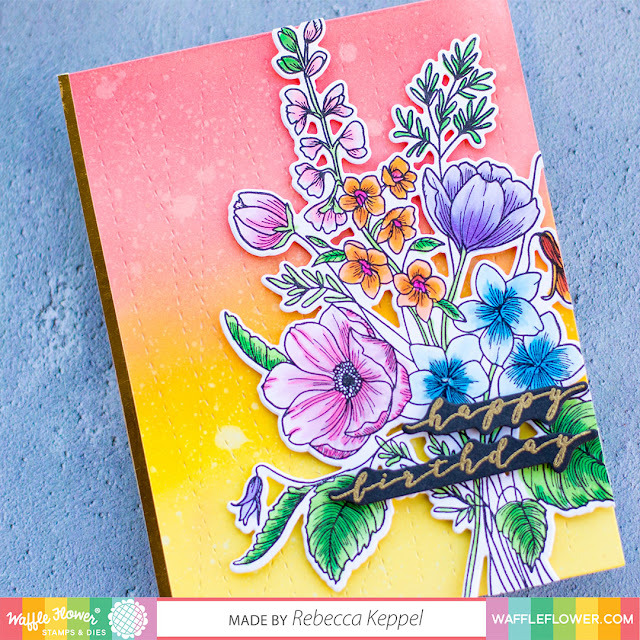 I made not now, but two cards with the Bouquet Builder 3 Stamp set. This set is illustrated by Karla Jodoin and I love how she includes lots of details in her floral illustrations so you know where to do the shading and blending. I wanted to see how different I could make the set look, by using a different color combination and placement of the bouquet. I could color this bouquet ALL.DAY.LONG. Next up is the XOXO stamp set which is a layering stamp set. But there are only two layers so even I can figure it out lol! I also used the Wave Texture die as the background on that one and included some hand stitching on some of the stitch lines. Next up is Be Him. I did two cards for this set too! That little elephant melts my heart! For this one, I paired one Be Him character with the unicorn from Be Her. Of course they pair perfectly! What a fun, busy month! Ok, on to the hop details! Here is the whole hop from start to finish! All the new products are linked down below! Thank you so much for stopping by! These are amazing. I really love the two bouquet cards. The backgrounds are beautiful and your coloring is as well. 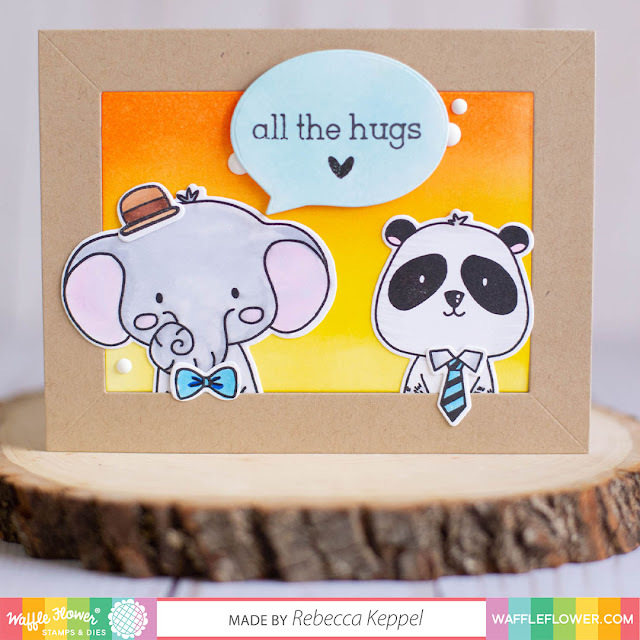 Your floral cards are lovely and those cute critters are sweet! The yellow, blue and orange on the flowers are just so pretty. I love the light feel. Just watched your video on the SSS Blog & came to see your work, which I love! The florals are my favorite--all gorgeous! Your floral card are beautiful especially the blue and yellow one. It is such a pretty color combination. I also love the animal cards. The unicorn is a must have and the little cup and tie is so much fun. I agree with you on that new bouquet stamp, I could definitely colour it all day long. I love the Be Him cards especially the one with the unicorn from the Be Her set. I just live how the tie hangs over the edge. Super fun. collect them and he'll be on my list. Beautiful coloring on the flowers! I love your critter cards! They are sooo cute! Great designs! Fantastic! I love your florals, and absolutely adore your cutely paired critters!!!!! What fun ideas you have here! Fabulous cards! I like how you offset the floral bouquet on your first card, and the colors are lovely. The hand stitching on the background of the XOXO stamped card is such a pretty touch. Beautiful cards, love love love them all, but the first two floral cards stole my heart for sure! OMG, you are SO talented! I'm loving the little critters in this release but I'm especially loving the florals. I like that you tried different colors and your coloring is beautiful. TFS! 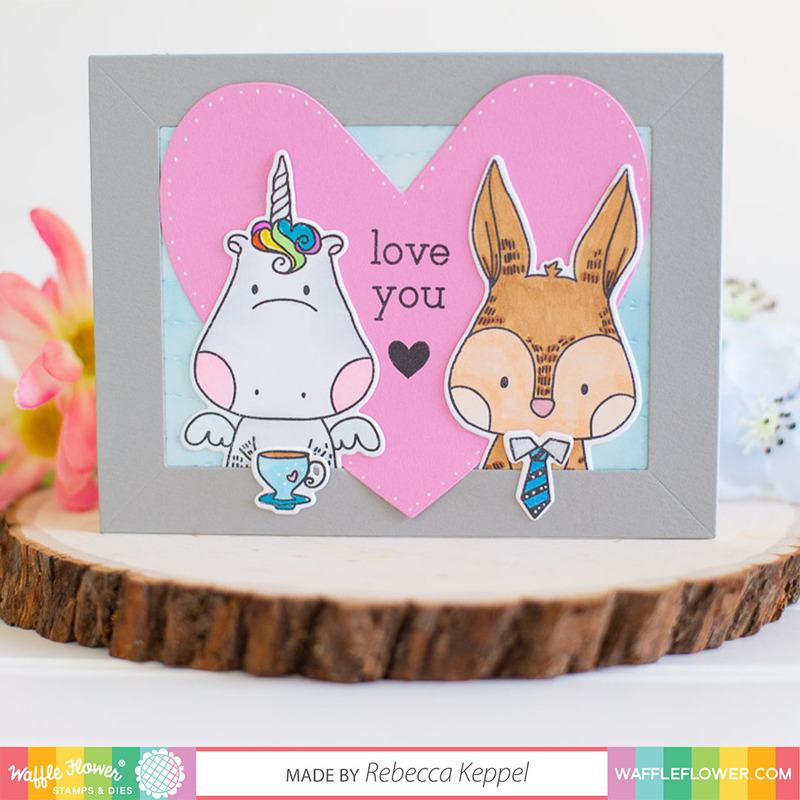 Rebecca, all of your cards are fabulous and I love how you share multiple cards with some of the setd. Like with the Bouquet Builder 3 set, both cards are wonderful even though different. Thanks for sharing. 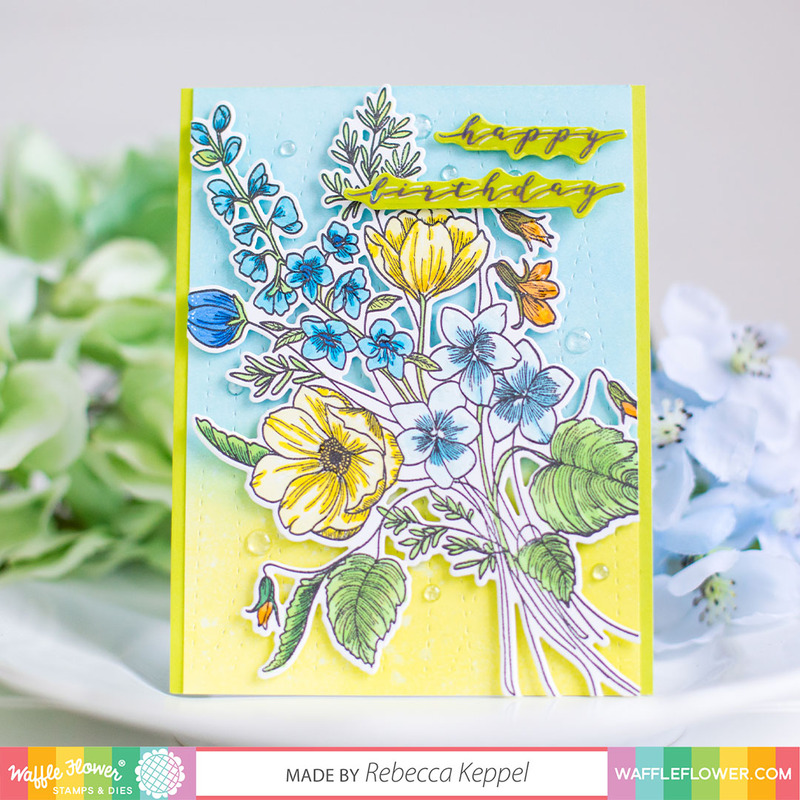 Gorgeous florals and your critter cards are funtastic! Wow! All your cards are really gorgeous!!! Love so much your stunning colouring and the beautiful layouts!!! Thanks for the inspiration!!! Love the backgrounds on the cards! The criiters are too cute! wonderful colors on both the floral cards and cute critter cards. Fabulous cards! Loving those floral cards especially! You did a great job changing up the look of the bouquets. I think the first one looks very late summery while the second one has a spring feel. I love the look of the hand stitching to go with the new die, and the Be Him set makes me just as giddy as the Be Her. Thanks for sharing all these great ideas! I love all of your beautiful cards! Especially the two bouquet cards! They are just gorgeous! Thanks for all the inspiration! Wow Rebecca! Your cards are terrific!!! The color palettes are sooooooo fresh and vibrant and alive! Your compositions are awesome too :) They're inspiring! I love all your cards! 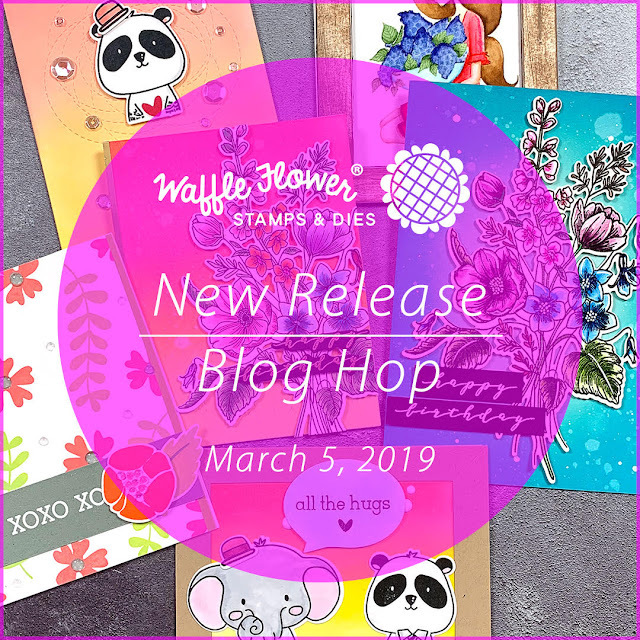 These are great new releases from Waffle Flower. I think the little critters are my favorite. Wonderful cards featuring the new designs! Love your gorgeous flowers! These are all so beautiful and fresh! LOVE your colorful designs! Gorgeous florals and darling critters! Fabulous floral cards and love those cute critters. What lovely and sweet cards! Gorgeous vibrancy of color and terrific designs.